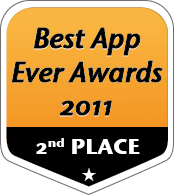 Nominated and voted by users from all over the world: Note Monger is winner of the 5th Annual Awards for Best Productivity App. The Android division ranked Smart Volume Control +, Kingsoft Office, Ted, Springpad, AndroClass , TouchPal, AutomateIt, Trello and Timesheet. Our goal is to help gather together the very favorite apps of the real users, not just the best-selling ones. We shined the spotlight on some great apps. Note Monger receives an honorable mention at the 5th Annual Awards for Most Useful App, category "the one app that you keep coming back to, multiple times per day." Finalists: AutomateIt, Smart Volume Control +, WhatsApp, Titanium Backup, SwiftKey, theScore, MtG Tracker & Life Counter, Antengo and iKnowU. Note Monger is rated second for Most Useful App on Android, being the best note taking app in this category. Best note taker I have found. Very easy to use. A free notes app with great usability. You won't forget things anymore. Five star rating. I have been using this note app for a couple months now and it works flawlessly. It has not crashed once and is very fast/responsive. One of the main features I wanted was to be able to add a photo to the note. What I really like about this is when you open the note, there is the photo within the note - you do not have to make additional/multiple selections to open the photo. Give this a try - you won't be disappointed. I love this app its so easy and has all the functions i need for home and work. I have been using Note Monger ever since I purchased my mobile. It is fast, very reliable and intuitively unique! You need absolutely no other apps that are within the same type of category as Note Monger! Forget the rest and stay with the best!! I truly appreciate an app that is smooth, seamless and designed for not just one particular group of demographics...This app can serve anyone and everyone. It is a one shot deal! Great app keep it up. I love it and have sent to friends that are glad their search is over! Its such a powerfull apps for replacing my palm OS note and todo list.